It's that time of year again! 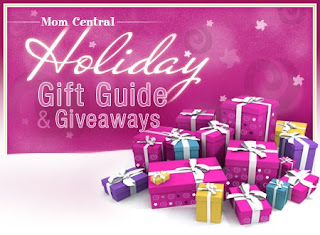 The second annual Mom Central Holiday Gift Guide has just been posted, featuring reviews of the season's best gift ideas for everyone in the family. Better yet, there will be new giveaways each week featuring hot items like Pandora Bracelets, a Daisy Rock: Debutante Electric Guitar Starter Set (Roo needs one! ), Cuisinart Rice-Plus Multi Cookers and more. Be sure to check back every week to see what's up for grabs. Disclosure: "I wrote this review while participating in a blog campaign by Mom Central. Mom Central entered my name in a random drawing to win a gift to thank me for taking the time to participate." I'll have to check it out. It's been ages since I logged in over there. Indeed she does need that Debutante Guitar! You've got the harmonica player, right?